Broad-winged, almost square-tailed, largely brown martin. 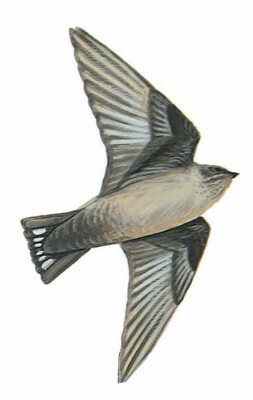 Dark brown upperparts lacking greyish tinge to rump; cheeks fairly dark usually contrasting with pale throat and underparts; fine spots on chin and throat can be hard to see; underparts buffish grey becoming darker towards tail-coverts without contrast; white spots in spread tail distinctive; underwing-coverts distinctly darker than flight-feathers (more uniform brown in Sand Martin). Flight action more soaring and fast diving than most other swallows/martins.